Son Heung-min scored twice as Tottenham beat Huddersfield at Wembley to strengthen their position in the Premier League's top four. 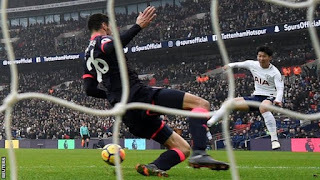 The South Korean produced two neat finishes, from Dele Alli and Harry Kane assists respectively, to take Spurs five points ahead of fifth-placed Chelsea in the table. Carlos Carvalhal's positive impact on Swansea continued with a fourth win in six games as they beat West Ham 4-1. Another South Korea international, Ki Sung-yueng, gave them the lead, with Mike van der Hoorn, Andy King and Jordan Ayew (from the penalty spot) ensuring a handsome win that takes the Swans above the struggling Hammers and up to 13th in the table. West Brom's grasp on a Premier League place was weakened again as Troy Deeney's goal consigned them to defeat at Watford. The Baggies remain bottom, eight points from safety with nine games left to play.